Do the kids need a Wireless Mouse for school laptops? Look what we found for you on Amazon! Hurry and get the PHILIPS 2.4G Wireless Mouse Slim Click Wireless Computer Mice Optical Mouse With USB Nano Receiver for PC, Laptop, Computer and Mac, Black today for only $6.49 from Amazon when you use promo code Z7AU9TEK at checkout! Save 50%! The nano-receiver stores in the back of the mouse so you don’t lose it. Check out all of the recent Amazon deals here! Amazon Prime members get FREE 2-day shipping!! If you are not a Prime member, get FREE shipping when you purchase $25 or more of eligible items across any product category. Get all the Wireless Mouse details below. This is a wireless optical mouse designed with Ergonomics model and high-precision connection via enhanced 2.4GHz wireless technology. 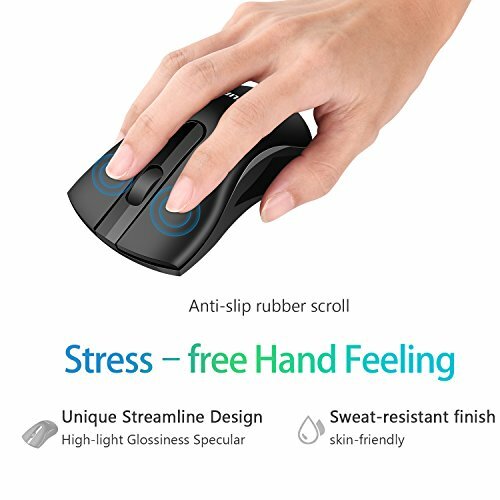 Enjoy the secure and stable connection of this mouse and stress -free clicks！Mouse cover surface features with durable and greatly soft material, so every grip is smooth! This smart mouse with perfect design fits well with your palm curve and offers the best support. The sturdy anti-slip rubber scroll wheel prevents your hand slipping when scrolling. Excellent wireless transmission: Equipped with the most advanced optical sensor and superb transmission, PHILIPS wireless classic mouse as well as the brilliant technology we assured, offer you the best quality and lasting comfort in use! Portable and handy size: 4.5*2.4*1.5 inch which is thinner than the ordinary mouse and is perfect for business trip. The Nano receiver is stored in the back of the mouse and no worries in losting it. Lightweight and compact design makes it easily to put into your computer backpack. Precise cursor control: The infrared light is not visible and our mouse supports multiple surface types with high sensitivity. Simple and practical, satisfied your working needs in office and home. Buy the PHILIPS 2.4G Wireless Mouse Slim Click Wireless Computer Mice Optical Mouse With USB Nano Receiver for PC, Laptop, Computer and Mac, Black from Amazon. Next articleBrown Gold, 100% Columbian Coffee – K-Cup DEAL! !